Some members of our Staging Recovery ensemble have been involved with this project, and we think it's a cause worth supporting. You can find out more and support the Crowdfunder here. Best of luck to the Reel Access team - we will keep our fingers crossed your campaign is successful! Our CEO, Andy Watson, has written a blog for Arts Connect, West Midlands exploring our training performances for education professionals working with Looked After Children. We are pleased to announce that our Artistic Director and CEO, Andy Watson, has received an MBE for services to the Arts in the Criminal Justice System, in the New Year Honours List, 2018. The National Criminal Justice Arts Alliance have put together a guide that provides those people with responsibility for supporting the education, health, well-being and resttlement of individuals within the criminal justice system with clear information on the role arts can play in supporting their objectives. 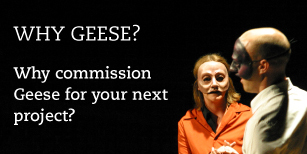 Geese are included the Arts, Culture and Innovation in Criminal Justice Settings Guide for Commissioners, with a case study of our recent NOMS-commissioned work with prisoners vulnerable to self-harm and suicide. Drawing on further case studies and research evidence, the guide aims to provide practical information and ideas for arts interventions and details of how to identify providers and activities that best match the needs of the commissioning organisation. We are delighted to be delivering a joint training workshop with our friends at Clean Break, in November. Staging Rehabilitation is a masterclass for both theatre artists and criminal justice professionals interested in the specialised field of arts in the criminal justice system. The day will be an introduction to the work of both organisations and participants will learn about their different working practices, understand the principles and theory underpinning their work, and explore best practice in this field. The day will be participatory, and involve drama and theatre exercises, groupwork, discussion and a plenary session at the end.